This is my dog Solomon Daniel Brown of Bear,DE showcasing his wheels. 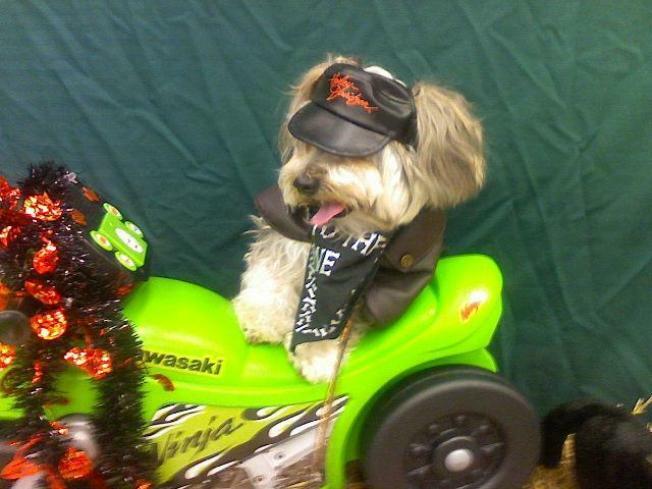 He is a motorcycle rider for Halloween. HAPPY SKALOWEEN: Here's a unique combination: trumpets, saxophones and Halloween! Head down to the Epicentre in Mira Mesa for a night of blues, ska and soul. Be festive- Halloween costumes are encouraged! Tickets are $10 at the door. HALLOWEEN DOGGIE CAFE: Join the San Diego Humane Society and SPCA for a night of fun with your pooch! Bring your friendly, on-leash and optionally costumed pup to hang out with their K-9 counterparts. Be creative with your costumes, threre's even a contest! ALTERNATIVE ALTARS: The opening reception for the exhibition "In the Spirit of Dia de los Muertos" is taking place at the Mixed Media Gallery. This exhibition features takes a twist on deep seeded tradition by featuring non-traditional altars from 13 artists.